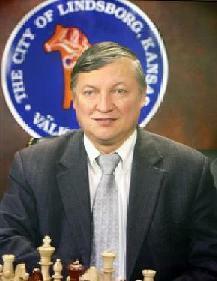 Seven-time World Chess Champion Anatoly Karpov established his first U.S. school in Lindsborg, Kansas. 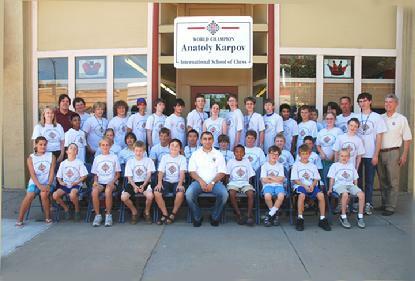 Anatoly Karpov has numerous chess schools throughout the world. 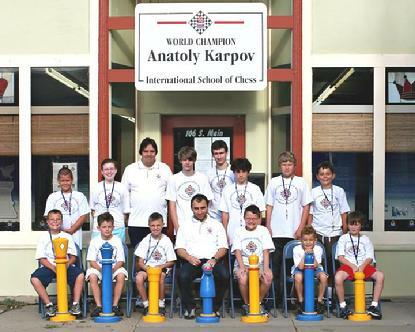 Welcome to the Anatoly Karpov International School of Chess. Chess is not only a game, but a proven learning tool to help students with problem solving, which in turn leads to improved math and reading scores. The International Chess Institute of the Midwest (ICIM), that operates the famous school, promotes chess in education, both in the public and private sectors. ICIM is organized exclusively for educational purposes, the making of distributions to organizations that qualify as exempt organizations under section 501 (c) (3) of the Internal Revenue Code, or the corresponding section of any future federal tax code. Congratulations to our 2018 chess campers. Our summer 2017 chess camp taught by Grandmaster Timur Gareyev. 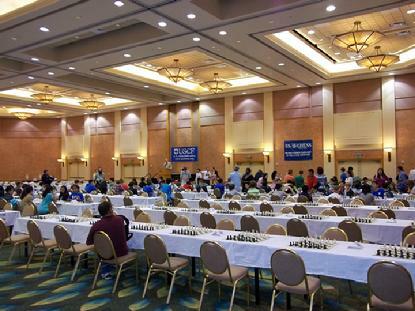 You are invited to attend one of the premiere chess camps in the United States. CLICK THE IMAGE to go to our CHESS CAMPS page. 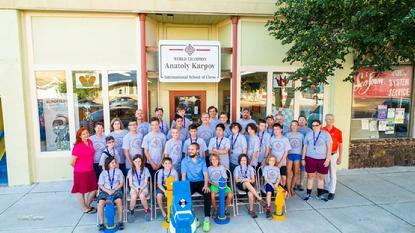 An elite group of about 30 campers gathered this week at the Karpov Chess School in Lindsborg to learn more about the game of chess. 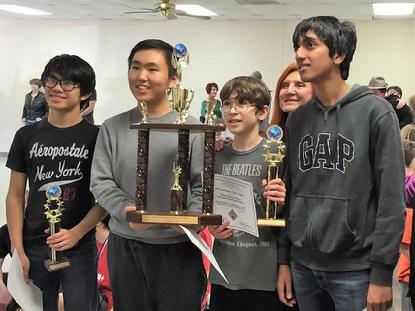 "We're pleased that among our students is a group of individuals who have won five Kansas State Divisional Championship titles," said David Blair, director of the chess school. Four highly skilled instructors led by Grandmaster Var Akobian will be giving personalized instruction to the students for a week at the Karpov Chess School. The students are housed on the Bethany College campus. "Grandmaster Akobian will practice his coaching and teaching skills with the students and then at the end of the week will be flying to China to coach the U.S. World Championship Team for their international competition," said Marck Cobb, president of the International Chess Institute of the Midwest (ICIM). 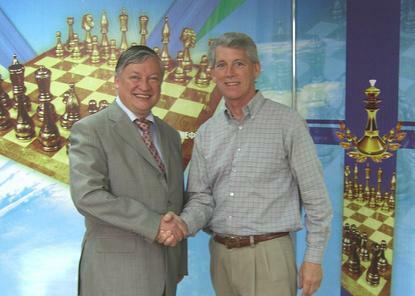 ICIM owns and operates the Karpov Chess School. 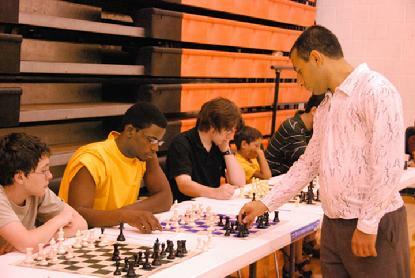 For more information on the chess camp program and chess teaching, please contact us at 785-227-2224. The Midsummer's Festival boasted something new this year. 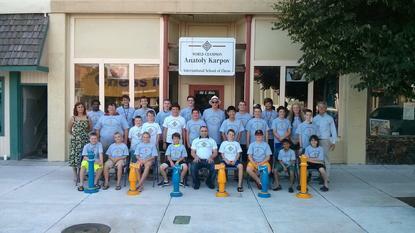 The Anatoly Karpov Chess School sponsored a 20 board chess simultaneous held at Riverside Park. Karpov Chess School Director David Blair played a 70 game "Simul." 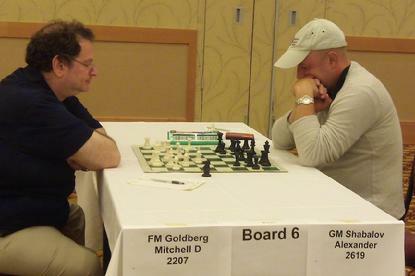 The Simul featured Blair moving from board to board, playing several players in one seating. Local players comprised the majority of Blair's opponents; however, others joined in later in the day. Two competitors, Quade Leonard and Paul Masterson, each, won a game. Blair offered several "valiant effort" draws (tie game) throughout the day to players who were losing their games, but played very well. Only one of the competitors, Maverick Lewis, would accept the draw offer. 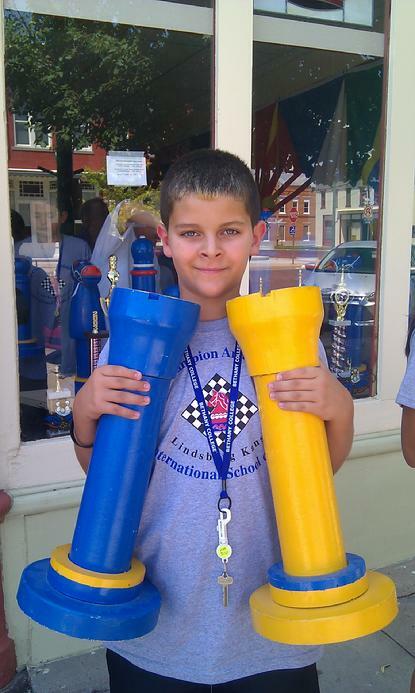 Lewis is Blair's 5th grade chess student from The Independent School in Wichita. Dan Masterson and his son Paul volunteered their time throughout the day helping out with the Simul, handing out prizes and drinks, and helping with set up and tear down. Since there were only two losses and one draw the entire day, The Karpov Chess School also gave prizes (T-shirts, book bags and DVD's) to other competitors who played multiple games or played well. The next scheduled Simultaneous will be held during Svensk Hyllningsfest in front of the Karpov School. 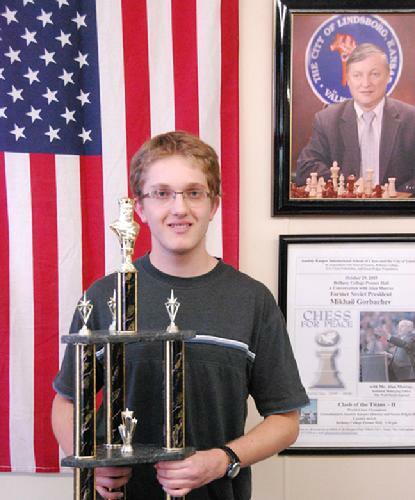 Kansas teenager, Conrad Holt, earned his third Grandmaster norm while playing for the University of Texas at Dallas (UTD) team. He earned it in time to compete in the collegiate Final Four which will be held at the end of March in Virginia. The young Holt, from Wichita, previously won 5th place overall in the Open Section when he earned his first norm. The World Chess Federation grants the prestigious title of Grandmaster to a player who achieves a high level of play against other Grandmasters in three tournaments. After Holt won his firm GM norm, he said: "It's pretty exciting, I guess. I got a draw in my last game in about 20 minutes, which gave me the points I needed for the norm. I wasn't worn our from a long game, so I celebrated by winning the Blitz tournament, then we ate some pizza." Holt is no stranger to Lindsborg. 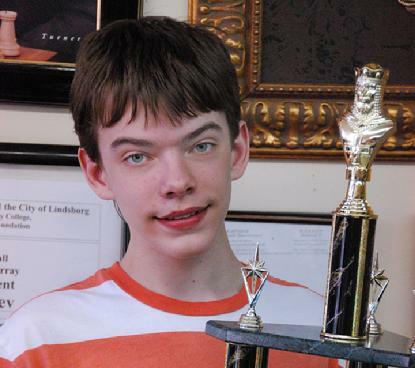 He won the 2008 U.S. Cadet Tournament, hosted by the Karpov Chess School. Holt earned his Expert rating in October 2007, which is a U.S. 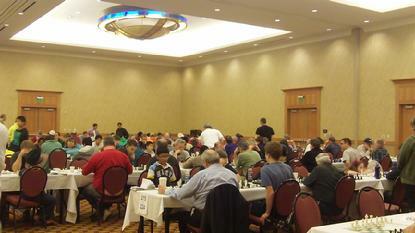 Chess Federation (USCF) rating of 2000, at Derby, Kansas. Nine months later, he earned the title of Master (USCF 2200) at the World Open that was held in Philadelphia, Pennsylvania. 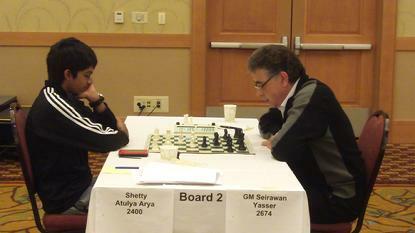 In 2011, Holt earned his Senior Master title (USCF 2400) at the Berkley International in January of this year. Holt attends the University of Texas at Dallas this fall on a full academic scholarship. He plans to major in bio-medical engineering. Last weekend, a team of young chess players from St. Petersburg, Russia came to Lindsborg and McPherson to compete with scholastic chess teams from throughout Kansas and Nebraska. The 2nd Intercontinental Chess Team Championships got underway with a Blitz tournament at the Karpov Chess School in Lindsborg on Friday night. Blitz chess is a form of rapid-fire chess where each player has only five minutes to complete the game. Russian player, Sergey Sememoka, defeated his rivals to win first place in the Blitz event. Sememoka, who came with his brother Ilya to the tournament, is a high school freshman who plans to work in the medical field. "I really like the team format of this tournament," said Mikhail Korenman, president of International Education and Cultural Services (INTECS), co-organizer of the tournament. "It is good to see the team members supporting and helping one another." The 1st Intercontinental Chess Team Championships were played in Chicago. The chess teams squared off on Saturday in McPherson. After the first round, teams from St. Petersburg, Lawrence, and Omaha were tied with wins. At the end of round two, only St. Petersburg and Omaha remained tied; however, Lawrence trailed by only a half point. The situation remained unchanged by the end of round three. St. Petersburg went into round five with a half point lead over Omaha and a full point lead over the Lawrence team. In this tournament, each team win counted as a point and each tie or draw counts as a half point. Svetlana Tiahova, age 11 and the youngest member of the Russian team, was winning all of her games. She and her school team in St. Petersburg recently won the European Team Championships. "I wouldn't be surprised if she were an Expert or Master by the time she is in high school," said David Blair, coach of the Lawrence team. The St. Petersburg team continued to win and at the end of round six, their closest rival was Lawrence who trailed by a point. This, however, changed in the final round when the Lawrence team defeated the St. Petersburg team. Both teams tied with a 6.0 score; however, St. Petersburg won the championship on tie-breaks. The Lawrence team fielded two-time Kansas State section champions Kaustubh Nimkar and Apramay Mishra, along with Eddie Wilson, and Sam Beaulieu. Nimkar didn't lose a game, the only player to do so in the top section of eight teams. The championships were also broken down by age categories. 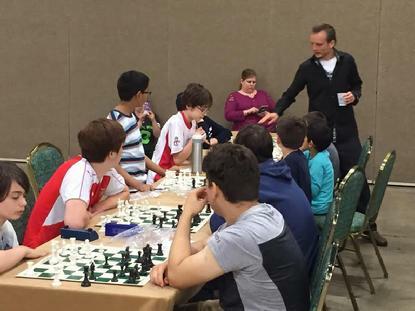 St. Petersburg won the under 16 category; Concordia under 18, Omaha Silver Knights under 14, Wichita Scholastic Chess Club under 12, and Omaha Green Knights under 10. 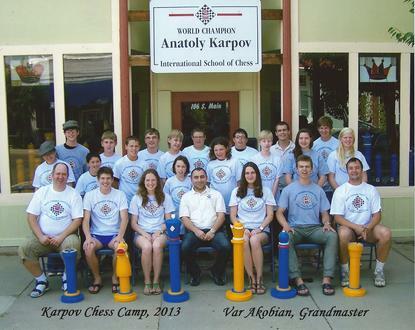 "I think we had a very successful tournament with international prestige," said Marck R. Cobb, president of the International Chess Institute of the Midwest that owns and operates the Anatoly Karpov International School of Chess in Lindsborg, Kansas. "The parents of players were pleased that their young people could participate in this international event." 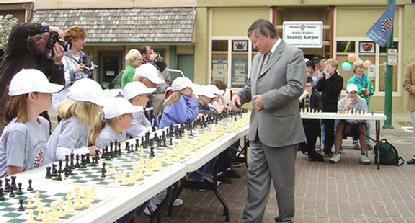 The Karpov Chess School was one of the co-organizers of the event. 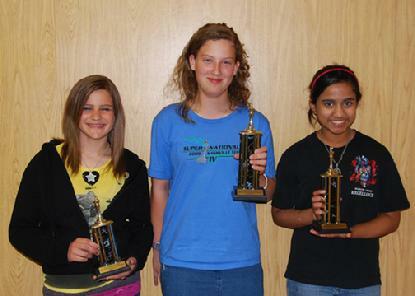 In other Lindsborg chess news, the Karpov Chess School recently hosted the Kansas Girl'sChampionship. 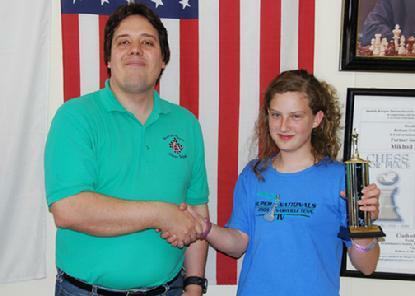 Hannah Purdy, who is a member of the well-known Purdy Family Chess Team from Oxford, Kansas, won the event. 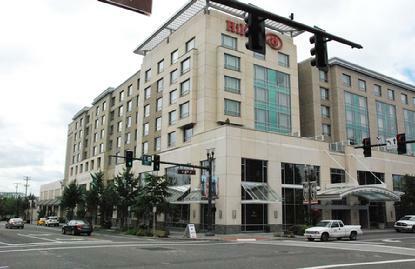 The event is a qualifier for the Annual Susan Polgar National Invitational for Girl's Championship, which is held each summer at Texas Tech University in Lubbock, Texas. 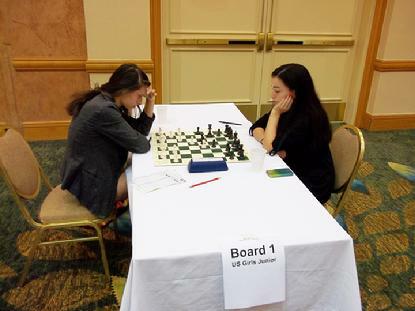 Girls from each state compete to determine who will represent their state at the Polgar Invitational. Ms. Purdy will represent Kansas. 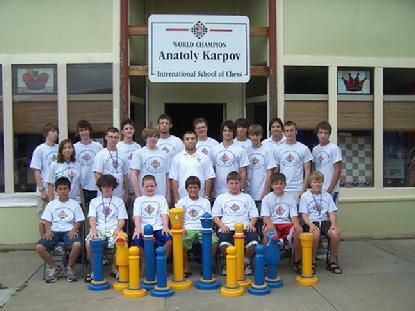 Thirty-three chess players from throughout Kansas came to the Karpov Chess School in Lindsborg to compete in the 10th annual Lindsborg Open. The Lindsborg Open has been called the Kansas Christmas tournament because of its close proximity to Christmas. 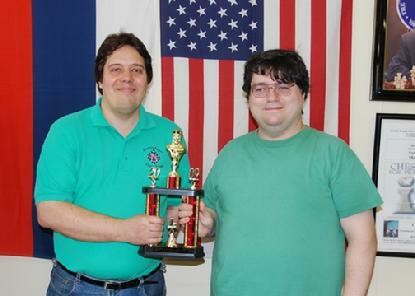 Jason Wawrzaszek, a chess Expert from Wichita, narrowly won 1st place with 4.5 points out of a possible five. 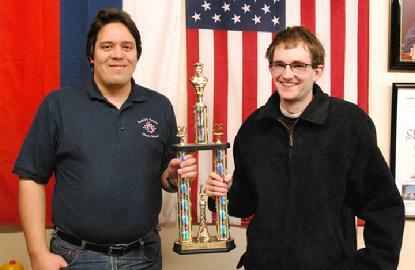 "Jason has been a consistent winner of a number of tournaments, including our Spring Quads," said Marck R. Cobb, president of the International Chess Institute of the Midwest (ICIM). 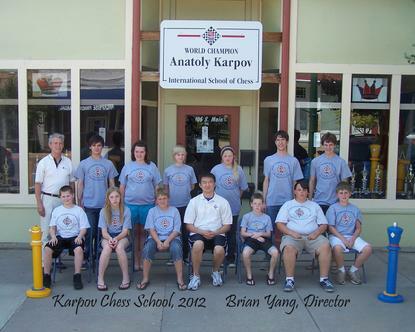 ICIM owns and operates the Karpov Chess School in Lindsborg, Kansas. Peter Bradshaw, Concordia; Lyle Taylor, Pratt; Gabriel and Hannah R. Purdy, Oxford, Kansas tied for 2nd place with 4.0 points, each. 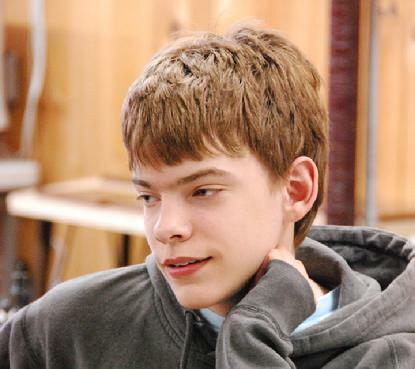 Gabriel and Hannah Purdy are both members of the well-known Purdy Home School chess team that often competes and wins scholastic chess team events. Tom Brownscombe directed the event. 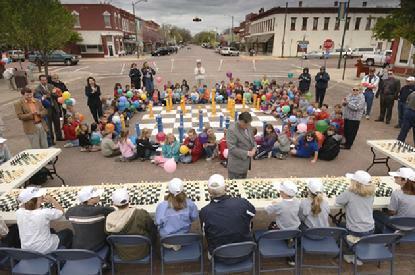 The next major chess event in Lindsborg will be the 2nd Intercontinental School Chess Team Championships on April 2-3. 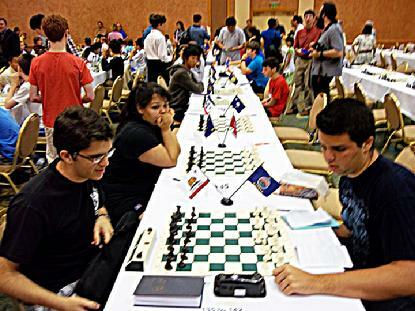 The international tournament will feature scholastic chess teams from St. Petersburg, Russia and Colombia, as well as teams throughout the United States. 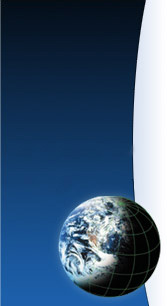 Additional foreign teams have been invited. 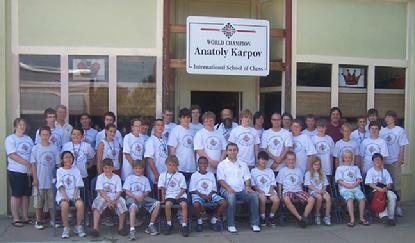 The Karpov Chess School ended its 2009 schedule of activities with the Ninth Annual Lindsborg Open on December 19. In an unusual turn of events, 16 year-old Thorton Bonner, of Spring Valley, Kansas decided to enter the Lindsborg tournament, although he had never played in a U.S. 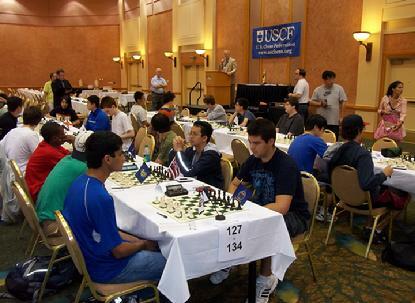 Chess Federation (USCF) sanctioned event. After five grueling rounds, Bonner found that he tied for first place, along with fellow Kansans Taimoor Noor, Jason Wawrzaszek, and Vladimir Inglesias. 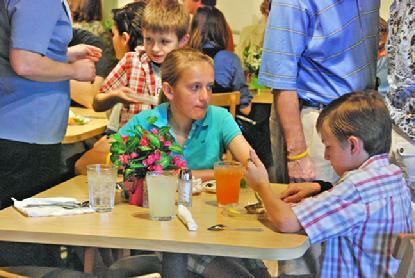 "This is the ninth consecutive year that we have held the Lindsborg Open," said Director Tom Brownscombe. 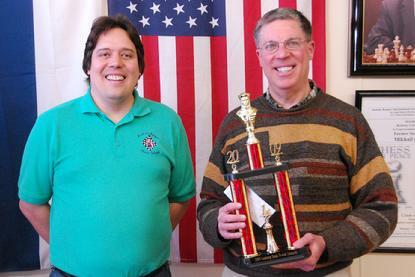 "It is always held around Christmas, so it's now established as part of the chess tradition in the Midwest." Noor won the first place trophy, based on tiebreaks, and Bonner took home the trophy for best result by an unrated player. Chess players typically compete in their own rating category, determined by USCF ratings, to assure they are paired with players with similar skill levels. 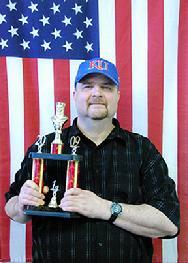 Kansas Chess Association treasurer Laurence Coker, Overland Park, and James Smith of Missouri shared first place for players rated under 1800. 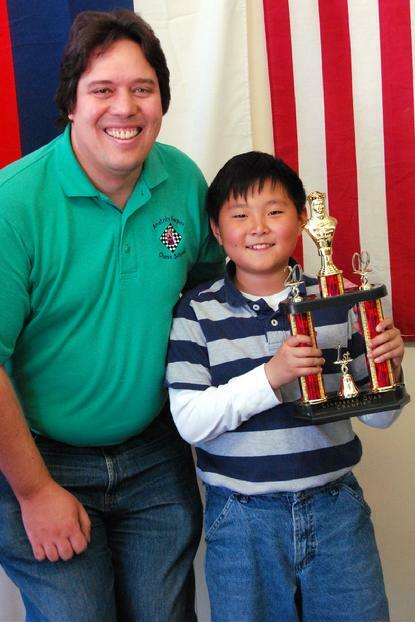 Fifth grader Brian Jiang of Sunrise Christian Academy in Wichita earned 3 points to win the first place trophy for players rated under 1600. C.J. 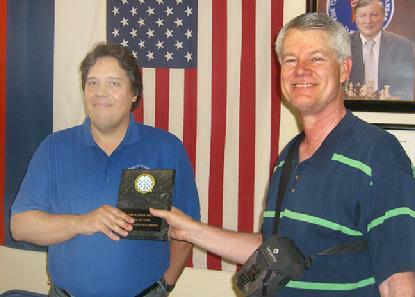 Armenta, who traveled from Missouri, also scored 3 points to earn first place in the under 1500 category. 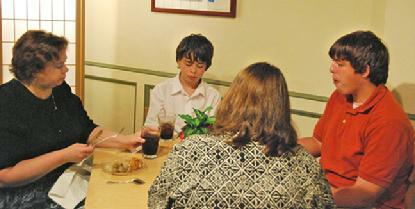 The Purdy family from Oxford, Kansas, have become well known in chess circles by winning numerous team and individual championships in scholastic tournaments. Gabriel Purdy took home the trophy for the best performance by a player rated under 1300. His sister Hannah, who is the current Kansas Girl's Champion, won the first place trophy for best performance by a female. Lindsborg fifth grader Tristan Donaldson won the trophy for best performance by a player rated under 1000. "It's good to see local students compete in our tournaments," said Marck Cobb, president of the International Chess Institute of the Midwest (ICIM). "We hope to increase this number in the upcoming year." 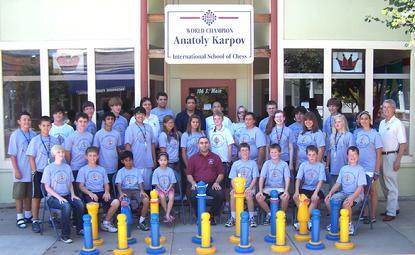 ICIM, a non-profit charitable corporation, owns and operates the Karpov Chess School. 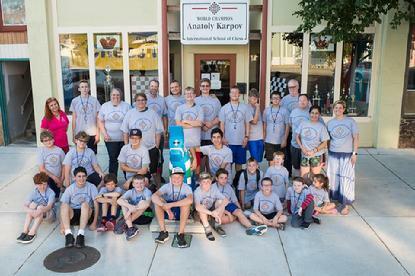 Through the generosity of donors, the chess school awarded 17 scholarships to area students to attend the two chess camps held at the Karpov School in July. Many students would not have been able to attend without the scholarships. Students attending the weeklong camps were treated to instruction by one of the top chess grandmasters in the United States. Grandmaster Var Akobian, winner of the 2007 World Open, not only taught the students chess, but also showed them the finer points of soccer during their free time. The chess school's director, Tom Brownscombe, worked alongside Grandmaster Akobian and Chris Purdy to provide instruction to the 49 students from throughout the United States who attended the camps. In June, Marck Cobb and his son Layton, at their own expense, boarded a plane to Moscow; at the same time Mikhail Korenman and three other families from Chicago also boarded a plane for Moscow. The combined group of seven adults and seven young people became known as the "American Delegation." The group had a their photo taken in Red Square before going to meet Anatoly Karpov. Karpov and the American Delegation boarded another plane to Surgut, arriving around midnight. Upon getting off the plane, they were greeted by a display of Northern Lights. "We couldn't see any darkness between sunrise and sunset," said Cobb. 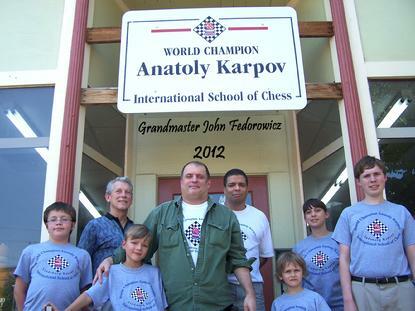 After a couple of bus rides, the group arrived in Poikovski, a small town in Siberia where Karpov has a chess school. 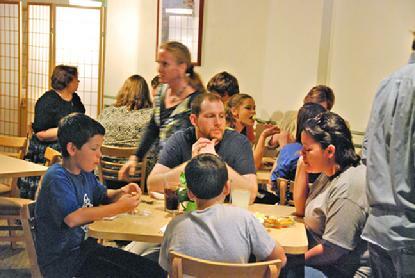 Some in Lindsborg may recall, it was Poikovski that sent a number of their young people to Lindsborg to compete and get to know their host families. 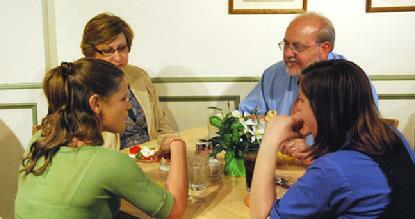 Poikovski boasts a cultural center that serves 22 smaller surrounding communities. 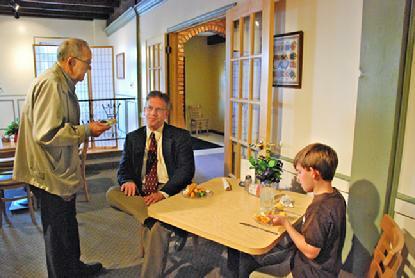 Their cultural center employs seven instructors, who in turn provide instruction to about 500 students. Over the next few days, students from both countries competed with one another, and despite language difficulties they managed to make some friendships. Another Lindsborg alumni flew in to join the main tournament; Grandmaster Alexander Onischuk visited Lindsborg on several occasions, where he taught at the chess school. Other grandmasters from throughout the world also arrived for the competition. The American student team placed fifth out of several teams in the Poikovski Youth Tournament. Upon leaving Poikovski, the Americans made their way to St. Petersburg and Moscow where they relaxed and toured. The Russians were holding another tournament in the city of Voronezh, the 13th International Chess Festival. The Americans took the train to Voronezh and played several matches with Russian students. 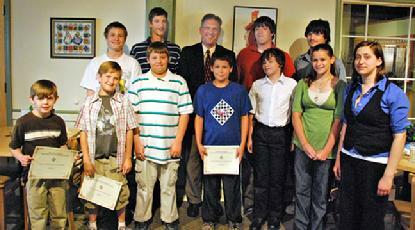 Karpov Chess School president Marck Cobb offered a scholarship to any student who would fly to Lindsborg. "It was a wonderful experience for students from different countries to get to know one another," said Cobb "It's all possible because of chess." 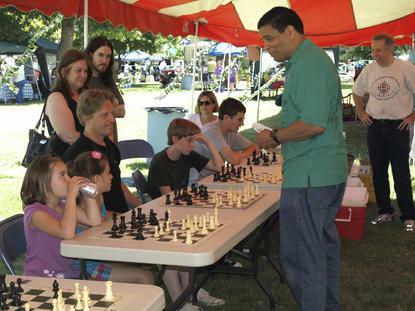 Director Tom Brownscombe expanded the chess school's reach by teaching chess in the local schools, such as St. Mary's in Salina, Canton-Galva, and the Lindsborg Virtual School. Tom also officiated at several national tournaments during 2009. 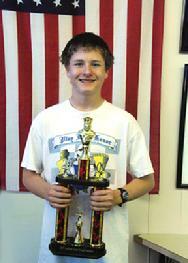 Brownscombe won the Kansas State Chess Championship in July. 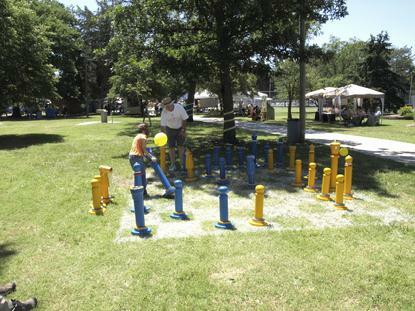 The Kansas championships have been held in Lindsborg for several years. This is the second Kansas Championship win for Brownscombe. He previously won it in 2007. He is also the former Nevada State Champion. 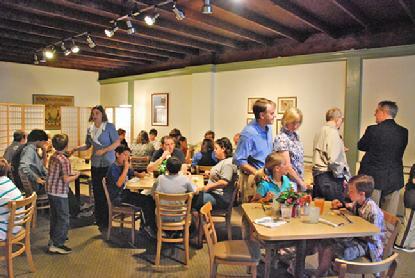 The Karpov Chess School hosts social chess nights every first and third Thursday of each month at 7p.m. Beginners are welcome. 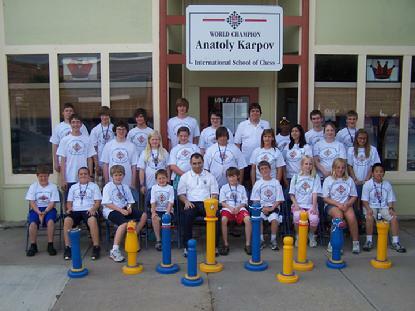 More information can be obtained by going to the school Website: www.anatolykarpovchessschool.org or call 785-227-2224. 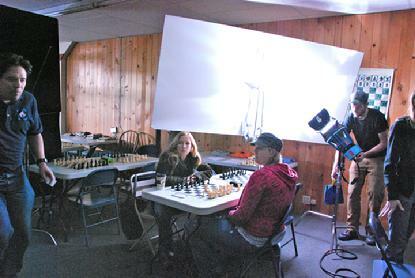 The movie AuPair Kansas features scenes shot in the Karpov Chess School. 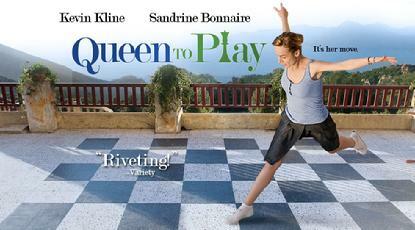 The comedy drama, that includes a chess component, is about a recently widowed woman who hires a Norwegian soccer player to come to a small town in Kansas to be a male au pair and to help raise her two sons. The movie stars the Norwegian comedy actor Havard Lilleheie and Spencer Daniels who recently played a young Brad Pitt in the movie The Curious Case of Benjamin Button which opens Christmas Day. Spencer also is cast in the upcoming new Star Trek movie. The movie has been selected as one of the finalists to be shown at the New York Film Festival during the summer of 2009. It is scheduled got general release later this year. 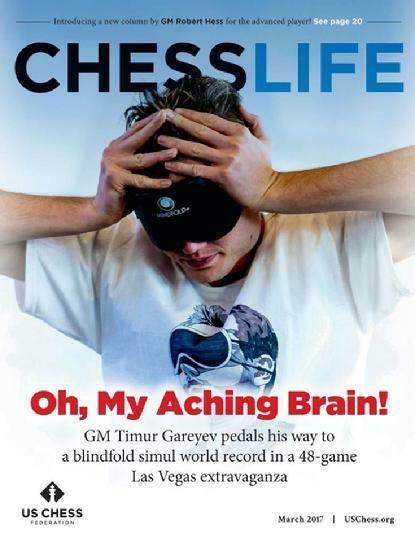 Anatoly Karpov's long awaited book, My Best Games shares an inside look into the genius of chess grandmaster Anatoly Karpov. In this book, scheduled for release in July 2008, 7-time World Chess Champion Anatoly Karpov shares what he considers to be his 100 most impressive matches. Each game features detailed diagrams, explanations of Karpov's well-crafted moves and descriptions of the tournament and opponent. Full of practical instruction as well as insight into Karpov's creative genius, My Best Games is a facinating study that no chess player can afford to miss. Questions or Problems with this website?